FelCor Lodging Trust Incorporated (NYSE: FCH), owns a diversified portfolio of primarily upper-upscale and luxury hotels that are located in major urban and resort markets. FelCor partners with top hotel companies that operate its properties under globally recognized names and as premier independent hotels. 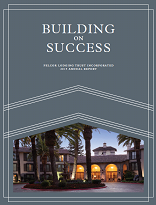 Sign up to receive email alerts whenever FelCor Lodging Trust Incorporated posts new information to the site. Just enter your email address and click Submit.